If you think that the fact that I’m writing about another book here means that I’ve finished Ulysses, you have more faith in me than you should. I am stalled somewhere near the midpoint. I needed a break and a welcome one came in the form of Lauren Grodstein’s An Explanation for Everything. In previous posts I’ve mentioned that Lauren was my writing teacher in my first few post-college workshops. If you ever get the chance to take a workshop with her, I highly recommend it. Luckily, you don’t have to be enrolled in the MFA program at Rutgers-Camden (the program she helps run) in order to learn from her, though–you can read her books. 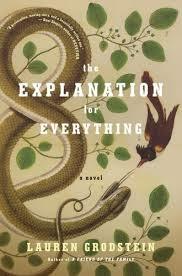 Of course, it requires some meta-reading to learn about writing from a novel like The Explanation for Everything, because it is so absorbing that its bones aren’t the least bit exposed unless you’re looking for them.